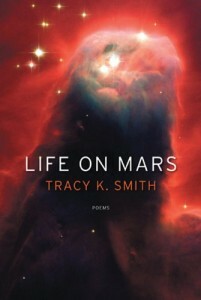 Shamefully, I have only just now discovered Tracy K. Smith’s Life on Mars (Graywolf), winner of the 2012 Pulitzer Prize for Poetry. I had the pleasure of seeing Smith read with the Dark Room Collective in D.C. last spring, and now can add, too, the immense pleasure of encountering her word on the page. Life on Mars is Smith’s third collection, following Duende and The Body’s Question (both from Graywolf). My experience reading the book was such that it’s hard to know where to start—with the elegant unraveling of sentences, the daring scope that encompasses the intimate and universal, the precision of description. Perhaps it is this incredible breadth that impresses me the most in this text: Smith guides us from upstairs hallway to stars with the same authoritative gaze, which at once wonders at and accepts all of the component parts. To call Smith meditative is true, of course, and this book is at its basis a powerful elegy for her father; her voice also has a note of prophetic vision. Through Smith’s descriptions, we have access to new images of our planet “ticking with mines,” can experience “The Universe as Primal Scream” through an infant screaming through an apartment wall as though reaching for the moment when “the whole building will lift off, and we’ll ride into glory like Elijah.” And Smith doesn’t expect us to simply take her word for it—the book is full of entreaties to join her in her observations and grappling. Look, she reminds us, listen. And discover my body is near. Before touch. Pushing off the ledge of the easy quiet dancing between us. This kind of twist is Smith at her most beautiful and harrowing, simultaneously—she is not afraid to allow the moments of greatest reflection or meditation occur in a space capsule halfway up the St. Louis Arch or in the presence of Bowie. In Smith’s poems, pain and forgiveness sit together, questions of authority and blame are acknowledged, but the foreground remains the emotional remnants of death and survival. I am certain that this is a book I will continue to return to for its incredible beauty and intelligence. I cannot help but imagine that Smith will continue to bite off more than most of us dare, and to carefully reveal just how much we’ve been missing.